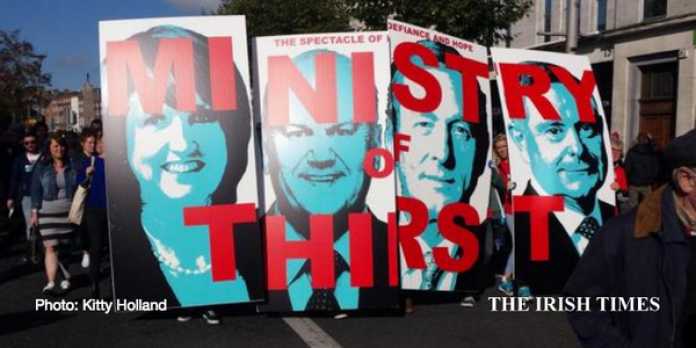 Thousands of people took to the streets in Dublin city centre today, in protest over the Government’s water charges plan. Roads were closed as groups from all over country converged on the capital. Traffic was at a standstill on Stephen’s Green and gardaí urged motorists to use other routes around the city. Gardaí closed off O’Connell Street and other roads on a rolling basis as groups from all over the country began the march at 2pm. Protesters carried banners opposing the water charges, including one with pictures of Government ministers superimposed with the text ‘Ministry of Thirst’. Posters indicated the protesters had come from all parts of the country, including Shannon and Waterford. Thousands of tweets about the march, tagged #Right2Water, described the protest as being one of the biggest ever seen in the capital.